Eight fire engines were called to tackle the blaze at Chilthorne Domer. The M5 southbound has now reopened between junction 28 (Cullompton) and junction 29 (Exeter) following a serious collision earlier today. The section of motorway in Devon was closed after an incident at 6.45am. Police have now completed their on-scene investigations and all three lanes were reopened just before 4pm. An earlier incident also closed the M5 southbound between junction 25 (Taunton) and junction 26 (Wellington) and the A30 was reopened in Devon at 2pm following an early-morning incident between the A35 and A303 at Otter Vale. 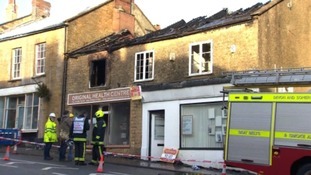 Fire broke out in the early hours of the morning at a property in the Somerset town. Tippet the Patterdale Terrier got stuck up the tree in Newton Abbott after chasing a squirrel. Firefighters have rescued a pet Bearded Dragon after being called to a house fire in Devon. Crews were mobilised to a house in Torquay, where they found heavy smoke coming from a ground floor bedroom. They confirmed there had been a small fire in a vivarium - and rescued a pet Bearded Dragon. Fire crews are clearing up after more than 15 engines were called to a cottage fire in West Devon last night. Fifteen fire crews from across Devon are fighting a thatch roof fire in Bondleigh. A group of firefighters from Devon and Somerset Fire Service are running 200 miles to show support and solidarity for their colleagues. A dozen fire engines were called to a home in Devon after its thatch roof caught on fire. Crews worked overnight to put the blaze out. An emergency call handler has been sacked after firefighters took an hour-and-a-half to reach a fatal blaze.